Half A House is a suburban home split down the middle. The house is shared by two families and consequently doubles density on a typical suburban block. Half A House is a long, thin building broken up by courtyards. These gardens permeate the home, providing each room with green outlook and filtered natural light. A simple strategy, defined by a thickened party wall, defines and divides the house plan. This wall bisects the dwelling, forming a long, wide corridor that runs the length of each house. This corridor acts as a social spine, and is filled with bookshelves and built-in storage. Rooms are arranged in a regular rhythm off this corridor, and each receive light, air and garden views. Half A House proposes a common front and back yard, imagining these as spaces for shared socialising, play and supervision. In the front and rear yards, the dividing wall steps down to provide a looser, shared edge of benches and planter beds. It provides the demarcation of a fence, without blocking neighbours. The side boundaries, meanwhile, are transformed into private gardens and spaces for retreat. Half A House is designed for a sloping, bushland lot and, as a consequence, gradually steps down its site. This approach is experienced joyfully in the building’s section and interior. Subtle level changes define different spaces while keeping the family connected across a continuous, single storey. At a human scale, the steps become studies, niches and daybeds upon which to perch, read and work. Half A House is contemporary and sculptural, and yet remains respectful of its context. It sneaks density behind a well-proportioned façade that is sympathetic and unassuming. In reference to the masonry that defines Sydney’s suburbs, the house is built from concrete blockwork. The roof is supported on fanned rafters, which lift north to draw sun inside. Half A House is a strategic design proposal based off a modular grid. This dual-occupancy design could be appropriated to suit the many sloping sites in Sydney’s middle suburbs, where the modules could be adjusted to step down the terrain. Half A House argues for considerate and gradual density in our suburbs. Rather than standing out, or towering tall, it deliberately stitches in to its context. As a proposal, it asks questions about how we can improve density within suburbia, without sacrificing beauty, elegance or craft. 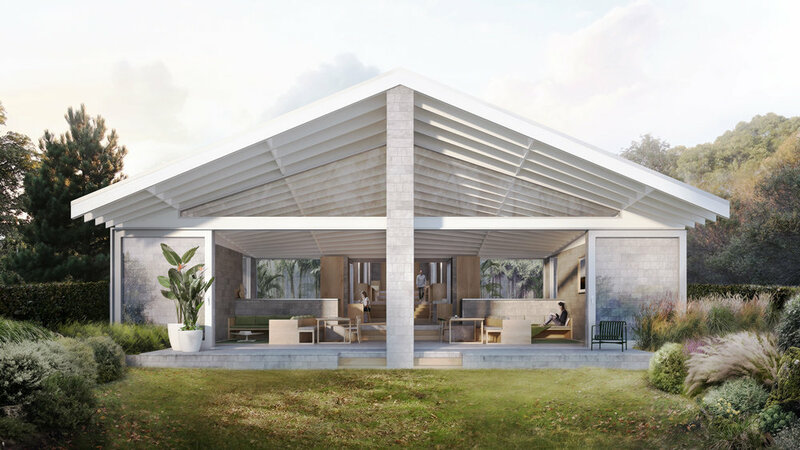 Half A House was formed in response to the Missing Middle design competition, run by the New South Wales Department of Planning and the New South Wales Government Architect's Office. This proposal was a runner-up in this competition.